Some commentators would have you believe that the only reason to be worried about the proposed mandatory filter is that a) it will be ineffective and b) it might cost something. They urge us to back away from the censorship arguments because these are the "least effective" arguments for opposing the filter. Apart from anything else, mere ineffectiveness is not going to motivate Australians to resist the filter. The Government runs many worthy, if ineffective, anti-obesity campaigns. People won't actively resist public expenditure on an ineffective project unless they actually object to the project in principle. Assuming that the Australian public cares enough about an ineffective proposal to vote against it for reasons of ineffectiveness alone is assuming a level of care that, frankly, has no basis in reality. Yes, some comparisons which suggest that Australian filtering will be identical to that imposed Iran, China and Saudi Arabia are somewhat overblown. However, as I argue in another post, these examples do serve to illustrate limiting cases and help to remind us that Australia is planning to move far closer to these examples than any other western democracy. However, to suggest that censorship concerns as a whole are ill-founded is extremely dangerous to the cause. If your only opposition to the filter is that it is ineffective, then you have little reason in principle to resist an effective filter. Make no mistake, the Government will implement an ineffective filter, if it is given a chance. However, an ineffective filter will never survive long term. Once the Government has established the right to filter, this or future governments will inevitably use the very ineffectiveness of the filter to argue that a more obtrusive filtering regime is required in order to address the deficiency. Any suggestion that the Government will suddenly be overcome by free-speech zeal and rollback an ineffective filter is pure fantasy - Governments rarely, if ever relinquish a power once granted. The point of resisting the filter now is not because the practical consequences of the filter being implemented are dire - most people simply won't notice, precisely because the filter will be utterly ineffective. The point of resisting the filter now is to oppose the principle that the Government has the right to decide for itself what Australians may and may not read on the Internet. If we don't resist now, then when? If we accept the Government's right to filter ineffectively now, then we will have no reason - in principle - to resist a Government attempt to filter more effectively in the future. If we concede the right to filter now, we will never claw it back. That's why censorship arguments matter. That's why they matter now. 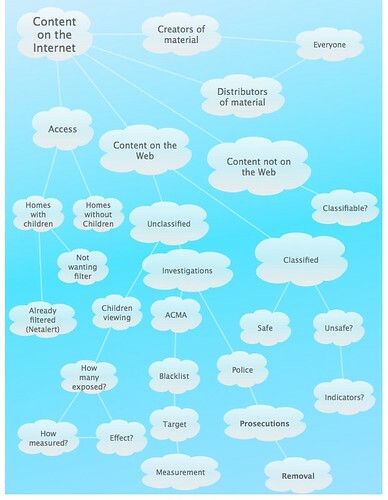 Alison Ruth has created a pictorial representation of the filtering topic space. This might be useful when thinking about any answers you get to the 10 questions about the mandatory ISP-level filter..